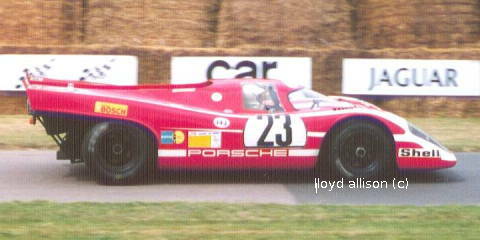 Porsche has been a long-term supporter of long-distance sports car racing. Powered by 4.5-litre, flat-12, 520hp, air-cooled engines, Porsche 917s won the Le Mans 24-hour race in 1970 (#23) and 1971 at 222.304 km/h. That 1971 record stood until 2010. 1972+: 917 Spyders, open versions of the 917, with 5+ litre, turbo-charged engines eventually developing well over 1000 hp, came to dominate the North American Can-Am sports car series (until regulations changed in 1974), putting a stop to the success of the McLarens. Some said that they killed the series. 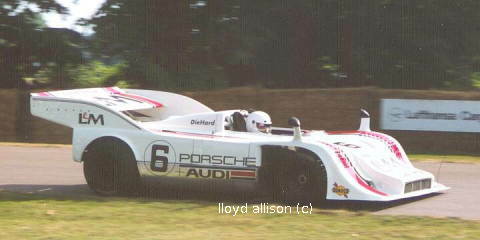 1976 and 1977: Porsche 936 won the Le Mans 24-hour race. 1979: Porsche 935 K3 won Le Mans. 1981: Porsche 936 turbo won Le Mans. 1982 to 1985: Porsche 956 won Le Mans. 1984: The Porsche type 962 -- (rear-)mid 2994cc, twin-turbo flat-6, 582kW@8200rpm -- was introduced for long distance racing and carried off many good results through the 1980s and on, inc. Le Mans 1986 (962C), 1987 (962C), 1994 (962LM). A 1986 Porsche 962, IMSA GTP, chassis #962-121, engine #361, sold for us$810,000 at Bonhams Quail auction in Aug. 2011. 1986: Derek Bell/ Al Holbert/ Hans-Joachim Stuck, 962C. 1987: Derek Bell/ Al Holbert/ Hans-Joachim Stuck, 962C. 1994: Yannick Dalmas/ Mauro Baldi/ Hurley Haywood, 962LM. 1996: Manuel Reuter/ Davy Jones/ Alexander Wurz, WSC95 won LM. 1997: Michele Alboretto/ Stefan Johannson/ Tom Kristensen, WSC95 won LM. 1998: Allan McNish/ Laurent Aiello/ Stephane Ortelli, 911 GT1 98 won LM.